Books by Jan Pen always have a special quality. The man was part of a generation of economists, that felt the obligation to educate the people. And this he can do well. With Harmonie en conflict Pen has written an economy book, that can be finished in one and the same breath. And it makes the reader truly wiser. Pen always gives his own opinion, but he balances this by a supply of so many arguments, that the reader can make his own judgement. The book is full of contradictions. Yes and no is a long battle, Pen must have thought1. Pen wants to analyse in a thorough way the conflicts of interests in the society, among others because sometimes they hurt especially the most vulnerable people. In an impressive nineteen chapters he studies a number of them (conflicts, that is, not the people). The discipline of the conflictology began in 1957. Pen leaves out of account the organization theory, and focuses mainly on the macro-economic phenomena. An economic conflict is a situation, where the decision of one person hurts the income of another. There is a conflict of interests. Harmony implies, that also the income of the other improves. Markets bring about harmony, because they generate natural prices. A discussion is out of the question. On the other hand the disturbance of an equilibrated market will of itself cause conflicts. The definitions indicate that the distribution of income is the origin of the conflict. Pen commits to paper some interesting thoughts. Two philosophies can be discerned. One argues that the income differences are caused by exploitation. Of course Pen can not refute this idea, but he is not convinced. He adheres to the idea of the Austrian School, that the income is an expression of the value on the labour market. That philosophy disapproves the use of power, because she is not natural. Who resists against the natural order, hits a wall. Yet here lies a problem, for the average worker can exert little influence on his labour value. It is not his fault, when for instance his company employs obsolete machinery. In addition large income differences lead to a perverse production, because a part of the capacity is used for useless luxury goods. Pen hopes that education will in the end bring about a more egalitarian society2. Since centuries the economists debate abour the question whether the production factors labour and capital can be reconciled in the long rung. It is conceivable, that in an developed society the capital will be abundant and therefore less profitable. Lucrative investments become scarce. In other words, the consumers are no longer willing to pay the grand profit margin. But Pen thinks, that this will not happen. For the real wages tend to rise more than the labour productivity, so that the purchasing power remains intact. The conflict of interest between the workers and the entrepreneurs is a consequence of the conflict between labour and capital. In general Pen is sympathetic towards the trade unions, because they try to more or less level the hourly wage in all branches of the industry. Thanks to this policy ailing firms are eliminated. Incidentally Pen states that the trade unions dispose of insufficient power to increase the wage share in the national income. They try it, and wage war for a better wage, but it fails to come right. On the contrary, despite all tales about competition the firms are able to pass the costs of pay rises on to the consumer prices. Thus the workers and the entrepreneurs together tend to run up the inflation. Unfortunately the inflation hurts mainly third parties, like pensioners, shopkeepers, small rentiers, or recipients of relief. Pen advocates an income policy by the state. In the absence of this policy the inflation can only be tempered by means of a structural unemployment3. Within the trade unions the interests between the various groups of workers clash. Especially in prospering branches the workers try to get an above-average income. It comes easy to them. But this means that the wage is no longer bound to the actual labour performance. Pen is an advocate of function classifications, that are coupled to a wage scale. In this way a normative income is fixed for each professional group. Of course this method is somewhat subjective, but at least the wage differentiation has to be based on arguments. This gives a certain rationality to the wage system. Another intriguing conflict exists between the various enterprises. Production offers nearly always advantages of scale. Therefore the enterprises can gain a competitive advantage by growing. The small ones lose the battle. In the long run just a few large enterprises conquer the lyon's share of the market in each branch. Such a market is called an oligopoly. Now these few remaining firms can fix the product price by themselves. The firms in the oligopoly want to prevent a race to the bottom, and therefore they make tacit price agreements. This is actually a virtual cartel. The state can even further such organizations, for instance by installing public corporations. Pen does not sympathize with this idea4. Incidentally Pen believes that the oligopoly is a harmonic part of the economy. In such enterprises the technicians determine the line of action, and they are sensitive to the common good. The technological progress is bound to cause conflicts. In the industry the employment is in decline. Especially the lower educated workers find it difficult to keep their jobs. Pen is confident that employment will be created in the service sectors. Of course the industry tries to force their new products on the consumers, among others by means of advertising. The commercial manipulation is the subject of a continuing criticism. As always Pen sees the sunny side. He even states that advertisements are good for the culture and for the press. He denies that the large enterprises have the power to generate large profits. However certainly in this chapter Pen provides statistics, that more or less contrast with his own view. Pen does not hesitate to analyse conflicts, that are somewhat philosophical. He devotes a chapter to the alienation of the individual in his sphere of action. Often labour is an unpleasant activity. Also the consumer feels sometimes lost in the plethora of offers5. But again Pen sees the positive side. The dissatisfaction can be overcome. Surely the reader will recognize this. Not everybody will see consumption and savings as opposites. Yet here exists an economic conflict. For investment is a way of consuming, namely of capital goods. And investments are crucial for the maintainance of employment. Since Pen is a plain Keynesian, he believes that a state policy of investments is needed in order to stabilize the economy, somehow or other. In our days this is again topical! Also the role of the banks is treated in Pen's book. Like the recent past shows, speculation is a potential threat6. Therefore Pen advocates a tax on capital gains. Then (1968) that tax was a hot topic, now it is less popular. Pen argues that the state and politics can oppose the banks. The economic growth leads to a growth of the state expenses, for new infrastructure etcetera. Pen recognizes its usefulness, but is critical with respect to the discipline of the parliament. Indeed, everything has its pros and cons, and especially politicians. Thus a new conflict emerges, because the rising state expenses affect the purchasing power of the private sector. Pen perceives with a Keynesian enthusiasm the advantages of an active state. To the extent that taxes are unavoidable, the various social groups try to shift the burden on to others. History shows some consensus, that progressive taxes are morally justified (principe of ability to bear). Besides they are a so-called automatic stabilizer of the economy. Pen can not be stopped, and also discusses the conflict between the farmers and the consumers. An active regulation and stabilization of this capricious market is indispensable. For nothing is as unpredictable as the weather. Besides the peasantry there are other classes. Consider for instance the well educated, that benefit from the establishment of a meritocracy. Pen hopes that this class will be restrained by the entrepreneurial class. But is is also conceivable that the well educated and the leading entrepreneurs together will form a managerial class. They could dictate their wishes to the people. Pen does not yet perceive such a conspiracy, but he advises to remain vigilant. He is struck dumb. All in all Pen sees conflicts as unavoidable and even as desirable, because they stimulate innovation. He seems to appreciate the dialectics, that tries to create a synthesis from the thesis and the antithesis. But Pen makes conditions: (1) harmony should be cherished, as well as the willingness for compromises7; (2) society should remain plural; (3) the levelling of incomes is desirable; (4) the state is a mediator. In general backing a sail is a virtue - a vision that your reviewer recognizes. Nevertheless Pen remains wary of the rise of the meritocracy and of the excessive incomes (even then!). 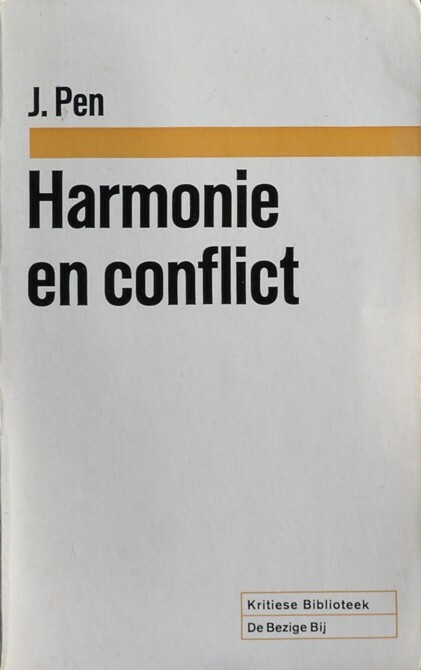 In conclusion Harmonie en conflict is recommended to anybody, who is interested in the political economy. Of course recent statistics are missing, but the contents seems fairly up to date. Pen has the gift to explain clearly the core of the conflicts. Often the dilemmas are devilish. But Pen is a born optimist, and has an unshakable confidence that evenually the compromise will prevail. Keynesians like Pen see no alternative for common sense8. The Keynesian streak of the book is part of its charm. Those interested will have to search the internet for second-hand bookshops, where they can buy Harmonie en conflict for a fair price.